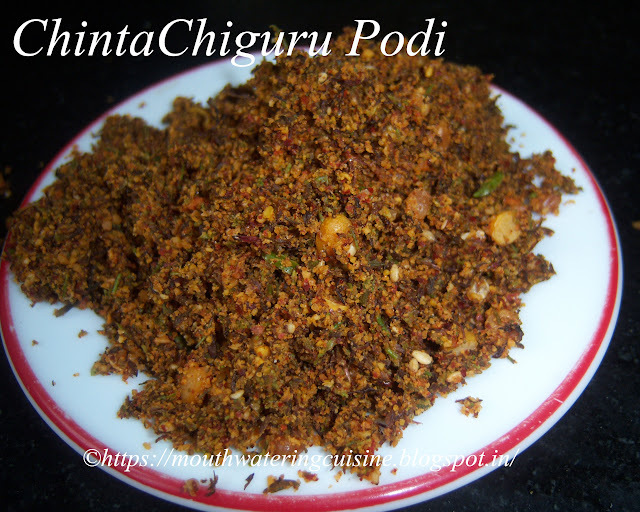 Chinta Chiguru Podi or powder with tender tamarind leaves is a very seasonal side dish for rice. We do not get it after this season. Once tender tamarinds started coming into the markets, tender leaves stops coming. They have little sour and little pungent in taste. Once they are cooked or add with any spice powders, the pungent taste goes off. We can make dal, chutney and podi with it. We need to make some preparation before hand to make any dish with it. We cannot discard each leaf from the stem, but we have to do it. A simple technique to discard is just press fistful of leaves between the palms and separate them. By doing so we can separate the leaves and small stick like stems easily. We need to clean the tamarind leaves before using them. We cannot discard leaves as they are very tender, press them between two palms so that the leaves discard themselves and fall in, simply separate the stems. Wash them thoroughly and dry them under shade. In a plate take all the dals and red chillies specified in ingredients. When they fry add til and pigeon peas. Fry them till they turn light brown colour. Switch off the flame and add red chillies and asafoetida. Stir well. By adding red chillies after switching off we can retain the nice red colour otherwise the powder becomes black. Once they are cooled, separate some portion of the dals. Keep them for further use. Join the remaining dals and all red chillies in the mixie jar. Add salt. Grind them to a fine powder. Add cleaned tamarind leaves to it and just press pulse or whip button for once. Do not grind it over press the button. This will make the leaves mix well with the spice powders. Add the left over dals to the powder. Mix well. 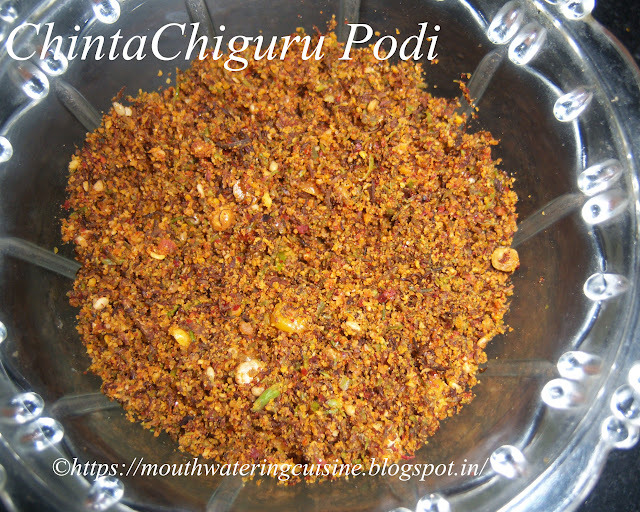 Serve chinta chiguru podi with hot piping rice. For more Powders and chutneys click here. Thank you visiting my blog. Hope you liked all my recipes. Any feedback and comments are appreciated.